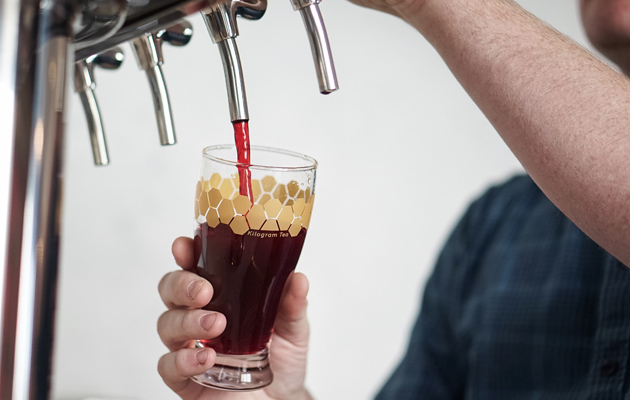 Ring in the new season with latest addition to our coffeebar menu: Hopped Cider. 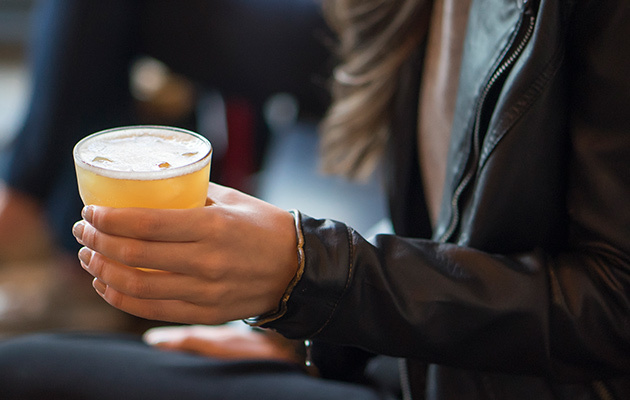 This delicious limited offering features a crisp blend of chai, apple cider, citra hops, and a touch of honey. This festive recipe was crafted with care by one of our talented baristas – Sarah Anderson. “In the weeks that I spent crating this drink, the temperatures in Los Angeles were soaring. As a Southern California native I know that we don’t see a big dip in the heat until early winter. 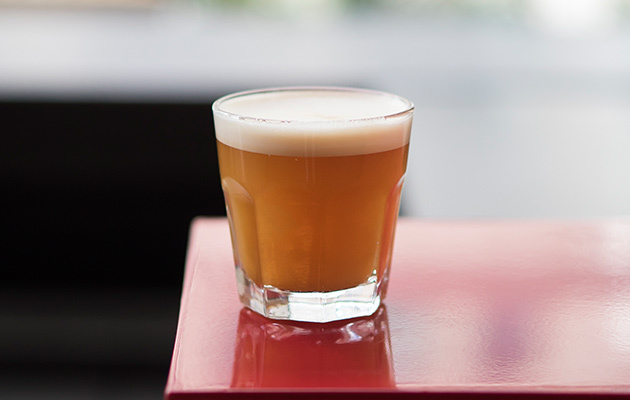 In creating our fall seasonal drink, I wanted something that would have fall flavors and taste good both hot and cold so all the regions that Intelligentsia calls home can enjoy it. Using unfiltered apple juice as a base, I added Masala chai to bring out those warm spices that remind me of fall. Citra hops come in to give a bitter citric kick to balance the sweetness of the apple. Iced its cool and refreshing, hot is warm and spicy, and the sparkling is a little bit magical. “ – Sarah Anderson. Stop in your local Intelligentsia coffeebar to try it today! Or try it at home and make it a boozy beverage – we recommend adding a splash of bourbon for the perfect autumn cocktail. Combine everything. Shake with ice for 10 seconds and strain into a glass. Dry shake for 10 seconds to incorporate honey. Shake with ice for 10 seconds. Strain into glass. Driving east on Division is now a whole lot more colorful, as gracing the side of the building that houses the Wicker Park Intelligentsia Coffeebar is now a brand new, four-story tall print by the art collective Sonnenzimmer. A duo that produces prints, paintings, textiles, books, and music, Nick Butcher and Nadine Nakanishi have been producing art as Sonnenzimmer since 2006 and are veterans of the design world. Trying to pin down their work in simple description would be difficult, except to say that the common through line for both the large mural, and the surrounding prints on display inside the Wicker Park Intelligentsia is a strong sense of color and playfulness. The Sun Never Sets is side-long slippery affair that mixes improvisation, airy guitar chimes, and sun-shaped mantras going in and out of phase. 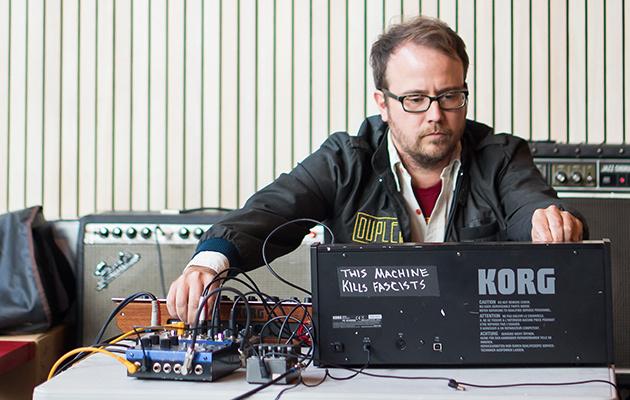 It’s the soundtrack to excavating your way free of a simulated reality. 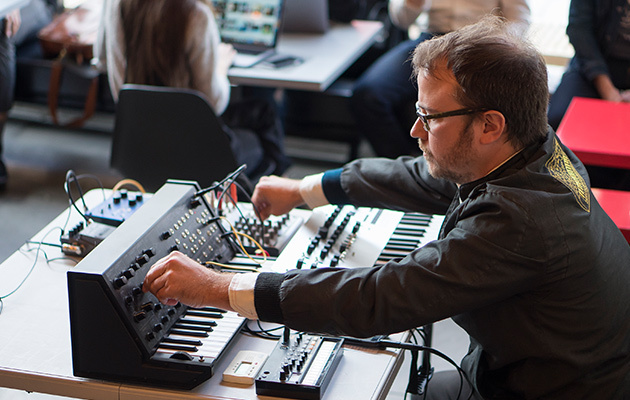 On Thursday, August 24th, Sonnenzimmer staged a performance around the album inside the Wicker Park Coffeebar to launch the album and celebrate the new art. By mounting an overhead camera and projecting their workspace behind them, Nick and Nadine were able to build a fully flat visual workspace that displayed their audio playground. Their audio playground, it seems, was a dual skeletal turntable setup with custom inlay record mats, wood block shapes, and other items that would be physically placed on top of copies of their records as they played in order to create new loops within the music itself. 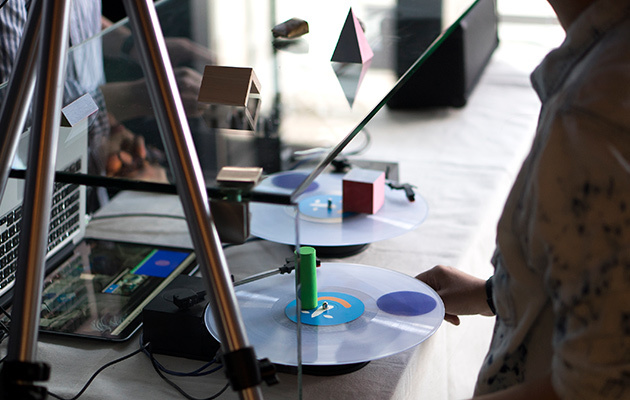 Utilizing a glass display, Sonnenzimmer was able to also stack objects and create new visual elements that overlaid the playing turntables in a three dimensional stack, but projected as fully flat art. The overall effect was a powerful visual representation that mirrored their latest prints and their large new mural, while at the same time creating a once in a lifetime new way to experience The Sun Never Sets as it’s ambient blips were distorted live by the artists’ themselves. The subversion of taking this type of art outside of traditional art spaces and creating it in a coffeebar, as well, established a unique approachability to an expression that that might otherwise exist only as an abstraction. And this is to the core of what Sonnenzimmer is creating. An array of different media that pursues different abstract elements and contours, but ultimately, art that’s designed to be experienced and enjoyed in real spaces. Ten years ago, our Intelligentsia Silver Lake Coffeebar opened it’s doors and helped shift the concept of what a coffeebar could offer the community around it, and what a single coffeebar could do for coffee nationwide. Almost immediately, nestled in Sunset Junction, Silver Lake Intelligentsia became a landmark of the Silver Lake neighborhood, with it’s iconic tile, buzzing patio, and constant line. But soon, word spread, and this ambitious new project from a young wing of this growing coffee company began to seep out past the borders of LA County. 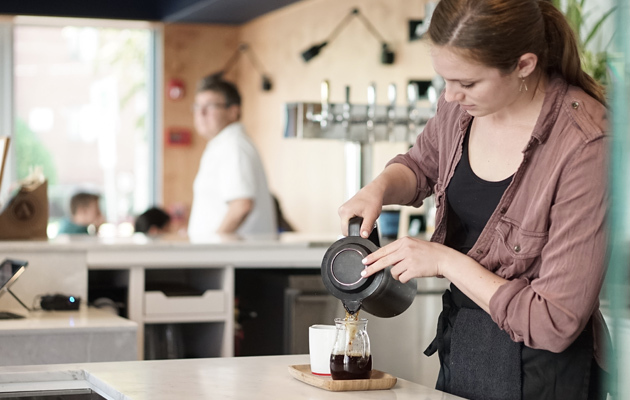 Intelligentsia Silver Lake popularized a new bar flow concept, where you would order with the barista pulling shots who greets you immediately upon entering, and pay for your drink as it flowed down the line with you. The line then built on anticipation instead of backed up at the hand off plane, and with the airy design based around light wood panels, the now famous blue and white tile, and the open patio under the signature red arches, the new Silver Lake coffebar became the newest social hub for LA. 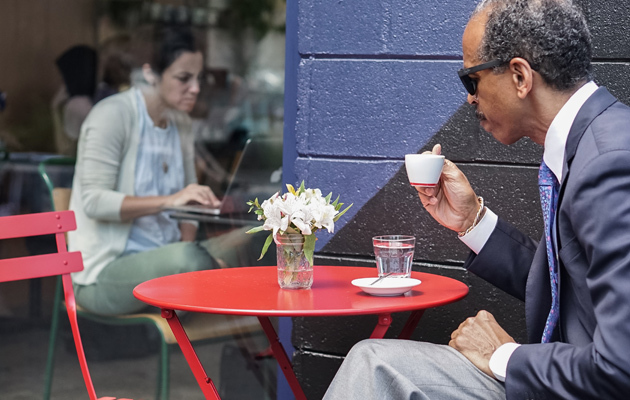 Coffee wasn’t a task or an office or a drug: it was an event. It’s hard to imagine that the magic of Intelligentsia Silver Lake’s success didn’t somehow shape in some way how modern coffeebars began to form. 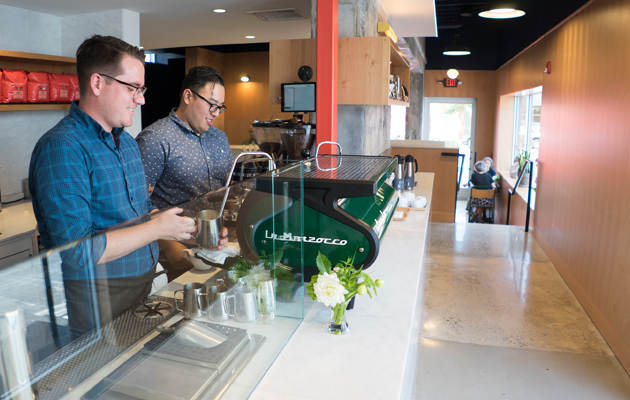 It grew to world renown all from it’s modest square footage and, along with a few other iconic coffeebars from that era in other cities, ushered in a new era where a coffeebar could be the cool, bustling, loud social mecca of a city. It only seemed right, then, to celebrate those ten years properly. 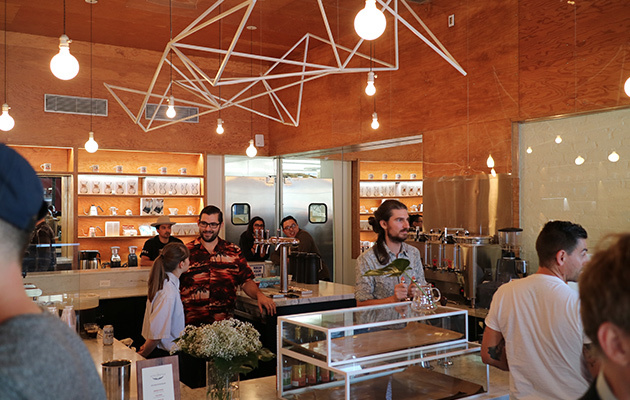 On August 17th, 2017, Intelligentsia Silver Lake threw open its doors to customers, friends, neighbors, employees, and those who had helped build it into what it is today with an all out tenth anniversary party. 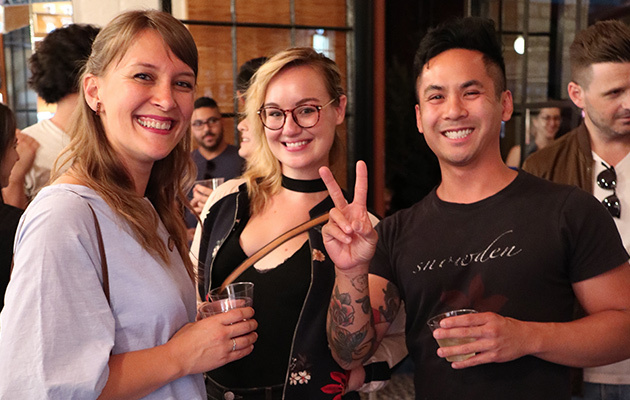 There was amazing food from Demly Pupusas, and our friends from Eagle Rock Brewery and Silver Lake wines helped bring the party vibe forward. 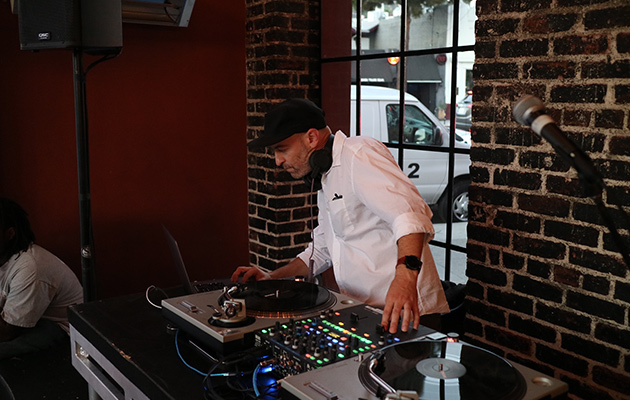 To cap it all off, co-founder of longtime Intelligentsia LA friends Stones Throw Records Peanut Butter Wolf himself ran a DJ set on the cleared out patio that drew in people off the street. It was the perfect way to celebrate the success of the store and really enjoy the recently remodeled space, which had undergone a facelift in 2016 to help with some bar flow and under the hood improvements. Being able to say “thanks” to everyone who had helped put the store together and “thanks” to everyone who comes into the store every day at the same time over a glass of wine, a beer, music and a pupusa was absolutely the only way to really explore the history and future of Intelligentsia Silver Lake. — Ted Lingle, The Coffee Brewing Handbook, 2011 Specialty Coffee Association of America. When we talk about extraction, we are evaluating the process in which particles dissolve from the ground coffee into the water. Roasted coffee is a wonderfully complex thing. Though only 28% of every coffee bean can dissolve in water, that 28% represents 800-1000 different flavor compounds, half of them aromatic gasses, and half of them soluble solids. It’s much, much harder to track what gasses we’ve pulled from the ground coffee into the brewed coffee, so we’re usually more concerned about the coffee solids we’ve dissolved: what are they, and how much of them have we dissolved? It’s pretty easy to break up the soluble material in coffee into four basic categories: fruit acids, which come from the fruit itself; fruit sugars, which are also derived from the coffee fruit; caramelized sugars, which develop during the roasting process; and bitter, dry plant solids. Acids dissolve pretty easily, sugars take longer to dissolve, and those bitter, dry plant solids are pretty dense and are made up of large molecules that take the longest to dissolve. Because these all dissolve in the same order, when we calculate an extraction yield as 15%, 21%, or 25% of the total soluble material, we can usually assume a certain concentration of those four main categories of coffee solids. From 0-18%, we’re seeing the fruit acids dissolving in high concentrations. From 18-22%, the fruit sugars and caramelized sugars start dissolving in higher concentrations, and from 22% to 28%, we see the dry, bitter plant solids dissolving in higher concentrations. Therefore, ideally, we’d like coffee extraction yield readings to land around 19-21% for the sweetest brewed expression of what that coffee has to offer. The extraction yield is just an average though — anytime you’re brewing coffee, the smaller particles will dissolve quicker, and the larger particles will dissolve slower. So in a 19% extraction yield, we’re assuming the larger particles might only be extracted to 17%, while the smaller particles maybe would have extraction to 21%. The more consistently even your grind setting, the more consistent your extraction yield will be. This is the main crux for the importance of not only just using a burr grinder, but a quality, precision burr grinder. The reason for this disparate extraction yield has to do with how the coffee actually extracts. There are three main phases: Wetting, in which the coffee particles absorb water and push the remaining gasses out; Extraction, in which the solubles inside the particles actually begin dissolve into the water and start exiting the coffee particle into the overall solution; and Hydrolysis, in which larger insoluble carbohydrates are broken down into soluble ones. With smaller coffee particles, the water can penetrate and dissolve the solubles very quickly. Larger coffee particles require the water to penetrate deeper, and have more solubles to extract, so it takes longer inside the particle to dissolve the desired solids before the brew leaves the particle to join the overall brewed coffee solution. It’s because of this relationship between brew time and particle size that we are able to control our coffee brewing process more specifically. When paired with an appropriate ratio of coffee to water, a brew temperature around 200ºF, and controlled agitation, extracting the positive flavor solids and leaving the negative ones behind becomes an easy solution. (Please forgive the pun). What does it take to create something that truly deserves to be called special? We know that it requires careful, deliberate, and unrelenting effort. Making coffees that are extraordinary in every way is an endless challenge, and is only possible when there is real collaborative effort between farmers, roasters and baristas. Success is measured both in taste and in the benefit obtained by everyone whose hands helped turn latent potential into manifest quality. It is measured also by progress, in recognition of the fact that developing expertise takes time and there is always more to do. Our formula has always been a simple one—work together, in close partnership, with coffee farmers who share a desire to do something great. Learn together, experiment together, and grow together. Obsess about detail and pursue quality together with a curiosity that will never be completely satisfied. That’s it. Amazing coffee is the product of amazing people working as a team; the magic comes from the synergy that is enabled when growing, processing, roasting and extracting coffee are connected in a single ecosystem. For nearly 15 years we have been working hand in hand with farmers around the world; this thing we’ve called Direct Trade is the result. Nowhere is the meaning of Direct Trade more evident or more tangible than at our Extraordinary Coffee Workshop, or ECW—an annual gathering of the Intelligentsia producer community who come together to exchange knowledge, share experiences, and unite in the pursuit of ever better quality. Every year at ECW new ideas are born. Since 2009 we’ve been using this forum as a place to learn and a place to strengthen our collective resolve to push coffee quality forward with all of our might. We move to a different place each year, visiting farms around the world together to study different approaches to coffee production and quality management in search of ways to get better at what we do. There is no substitute for direct visceral experience. It is not easy to get dozens of farmers from all over the globe together in one place, but the outcome is worth every ounce of effort it takes to make it happen. This is Quality. This is Community. This is Direct Trade in action. 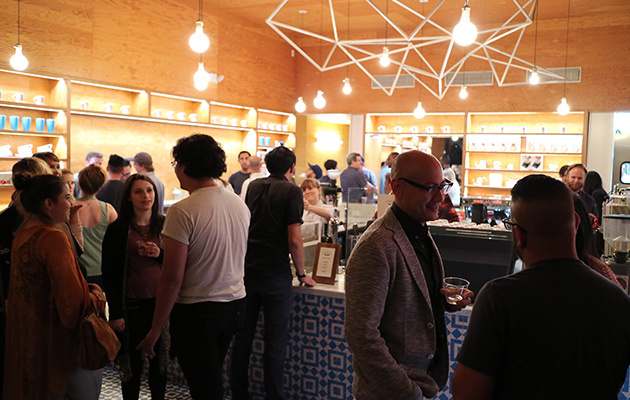 The 2015 Extraordinary Coffee Workshop was held November 2 – 6, 2015 in Guatemala. A couple of weeks ago, we got a surprising phone call from The Conan O’Brien Show. Seemingly, there’s a producer on the show named Jordan Schlansky who’s very into coffee, specifically Italian coffee, and not so much into American coffee. Conan took umbrage with this and asked if he could bring Jordan to our LA Roasting Works for a lesson on what makes great coffee in America. We happily obliged! Fortified! That’s the best word I can think of to summarize the way most of us are feeling after the Extraordinary Coffee Workshop that took place just over a week ago in Guatemala. It never ceases to impress me just how much power there is in community, and how easy it is to find inspiration when surrounded by people who share a genuine passion for what they do. That is the real secret to the success of ECW; this unique collection of talented coffee people from very different backgrounds who, when we unite and spend meaningful time together exploring ways to get better at what we do, always discover new strategies to help unlock latent quality potential and more reasons to keep challenging ourselves. The content and the locations change each year, but the outcome is the same: a return home with more vigor, fresh ideas and renewed motivation to try even harder in pursuit of excellence in coffee. ECW serves as a validation to all of us that there is deeper meaning in the labor we do, that all the deliberate, time-consuming effort required by so many individuals on a daily basis serves a tremendous purpose. It reminds us that the frustrations we encounter as a result of being so obsessive about getting things right (and so self-critical when they don’t turn out exactly as we had hoped) are worthwhile because the result of this obsession is something profoundly beautiful. Part of what drives ECW is that spending this time together as a group reinforces our collective understanding that we are all doing some heavy lifting, and the weight feels lighter when we look around and see that we are actively supporting each other’s efforts and helping each other succeed. The 5 days were full–we visited farms in Antigua and Acatenango to study different management systems, learned about soil microbiology and nutrient cycling, toured a progressive dry mill, worked on cupping calibration and extraction science, got up to speed on some groundbreaking studies on coffee variety behavior, and spent an entire day sharing some of the collective knowledge of the ECW massive with a group of 150 Guatemalan coffee farmers. The 7th annual ECW was the biggest one we’ve done to date–nearly eighty people from sixteen different countries came to participate, more than double last year’s event in Ethiopia. Many of the producers have returned home just in time to greet the beginning of the upcoming harvest, and our team is charging directly into what is always the busiest time of the year, so there is not much time for rest. Fortunately we’ve got the all the energy generated during the ECW week as fuel to power us forwards.